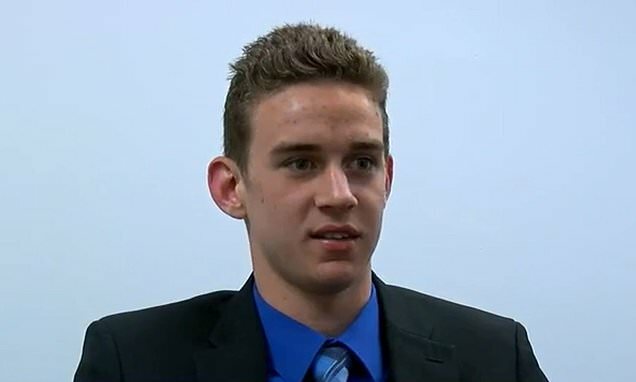 Jerome Kunkel, 18, of Walton, Kentucky, sued the Northern Kentucky health department on March 14 for barring him from attending school and basketball practice because he refuses to get the chickenpox vaccine on religious grounds. The basketball captain's case is now scheduled to be heard in Kentucky's Boone County Circuit Court on April 1, according to The Courier Journal. Kunkel is among 18 students who were banned from stepping foot on the Our Lady of the Assumption Academy grounds starting March 14, following a chickenpox outbreak affecting 32 of the school's students. Northern Kentucky Health Department officials deemed the outbreak so serious that the academy was shut down for three days and mandated that students without chickenpox vaccinations or medical proof of immunity were barred from going to the school for three weeks, until the infection phase has passed. It's said that 13 per cent of the school's students were infected, meaning the student body is an estimated 246 students. As a result, Kunkel, who has not had chickenpox, is not allowed to go to class or finish his senior year basketball season. Kunkel is now suing the state's health department, its Cabinet for Health and Family Services and public health officials for violating his constitutionally protected freedom of religion. Kunkel said the chicken pox vaccine violates his beliefs because it's produced using cell lines derived from legally-aborted fetuses in 1966.